In addition to Renwick's current residential offerings of single family homes, paired patio homes, 'zero lot line' homes and apartments, they now plan to add townhouse to the mix. According to their website, the town homes will be located near the village center, pictured above. 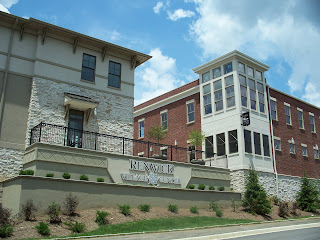 According to Shannon Richardson who works for WS homes, the developer of Renwick, the townhouses will be priced between $200,000 and $240,000. Plans are calling for the majority of the town homes to have two bedroom s located on the second floor with a garage on the basement level. The main level will have varying sizes of living room space with an open kitchen.